Last year, I investigated claims that music legend and diva, Cher, was set to play a vampire in American Horror Story: Freak Show, the fourth season of the American Horror Story series, which debuted on Oct. 8, 2014. Since watching the first season of AHS, I have secretly hoped they would incorporate vampires into the a storyline. That’s why I was disappointed with the findings of our investigation: we discovered that “teasers” circulating online suggesting Cher would play a vampire—an example seen in the video below—were actually made by AHS/Cher fans; the claims Cher would feature in the season were little more than wish fulfillment. But this summer, my hope for vampires was renewed when another diva was signed on to play what appeared to be a vampire on the series’ latest season, American Horror Story: Hotel: pop sensation, Lady Gaga. Her previous acting roles include: La Camaleón in Machete Kills (2013), Bertha in Sin City: A Dame to Kill For (2014), and Girl at Swimming Pool #2 in “The Telltale Moozadell,” a 2001 episode of The Sopranos. I disagree with Murphy’s label and think the storyline does involve vampires for a number of reasons. For the purpose of this article I am only referencing up to episode two because originally I wrote the article with plans to publish it before episode three was released, but due to a trip to Texas for a vampire studies symposium, I ran out of time. If you have not watched the show yet, be warned spoilers ahead. The Countess and Donovan head out to a local cemetery for a public screening of Nosferatu (1922) and pick up another couple for a foursome. All four head back to the hotel for some fun, but little did their new friends know, their sexual encounter would be a fatal one. Besides gorging on human blood, we see subtle vampire hints dropped throughout the first episode. For instance, a realtor barges into Donovan’s room with the new hotel owner and opens the drapes; Donovan cowers from the daylight and gets rather snippy and runs to the Countess to complain. Sunlight, of course, is a common bane to vampires. We also get the suggestion that Donovan may be undead, as it’s suggested he died of an drug overdose in 1994. A fast cut from the present day shows he was discovered by Iris (Cathy Bates), his distraught mother in a room in the hotel with Sally (Sarah Paulson), another junkie after he had taken a fatal overdose of heroin. The Countess suddenly appears, and raves about Donovan’s good looks while cradling his limp body. It’s clear from juxtaposing Donovan’s appearance between the present and the past that he has not aged. In the second episode “Chutes and Ladders” (Oct. 14, 2015) a male model, Tristan (Finn Wittrock), captures the Countess’ eye from the catwalk during a fashion show in the hotel. After Tristan’s performance, he breaks into the penthouse suite in a drug-induced rage looking for cocaine. Donovan surprises the intruder and is about to make a meal out of Tristan, when the Countess shows and orders him not to. Tristan flees the scene to discover more of the hotel’s eccentric guests. Later, we find Tristan and the Countess naked, wrapped in each others arms. A large self-induced bloody gash on Tristan’s face from earlier has disappeared and he is blown away by his new flawless skin. The Countess explains to Tristan how she was born in 1904 and that he is never to drink from the dead or sick. We also get introduced to the Countess’ fair skinned, blond haired children. Jumping back to the first episode, a couple of Swedish tourists renting a room in the hotel are relocated to a new room after some strange going-ons. One woman wakes from a nap, to discover a couple of the youngsters feeding on her best friend as she lay on the floor. What actually confirms the presence of vampires in the series was the end credits in episode one. I actually reversed the recording to check, and they list the Countess’ children from the show as “vampires.” I tried to find a screen shot of it, but was not able to; however, IMDB lists the characters as “Vampire Girl” (Jessica Belkin), “Vampire Boy #1” (Cannon Mosteller) and “Vampire Boy #2” (Emmory Mosteller). Mention Elizabeth Báthory—or Erzsébet Báthory, her Hungarian name—to anyone and they will all know her as the Vampire Countess who used to bathe in the blood of virgins to regain and maintain her youth. Images abound of her as a beautiful young woman relaxing in tubs brimming in blood as if it were a relaxing spa. People with haemophilia have lower clotting factor level of blood plasma or impaired activity of the coagulation factors needed for a normal clotting process. Thus when a blood vessel is injured, a temporary scab does form, but the missing coagulation factors prevent fibrin formation, which is necessary to maintain the blood clot. A haemophiliac does not bleed more intensely than a person without it, but can bleed for a much longer time. In severe haemophiliacs even a minor injury can result in blood loss lasting days or weeks, or even never healing completely. In areas such as the brain or inside joints, this can be fatal or permanently debilitating. Primary prophylaxis is when regular continuous treatment is started before the age of two years, or after the first joint bleed has occurred. Secondary prophylaxis is when regular continuous treatment is started after two or more joint bleeds or after the age of two years. After I checked out the cast list for the show, I also discovered some vampire connections worth mentioning. Ex True Blood regulars Denis O’Hare (who played Russell Edgington) and Alexander Skarsgård (who played Eric Northman) will be making an appearance this season. O’Hare plays the character Liz Taylor, which to me was unrecognizable sporting a shaved head, makeup, platform shoes, flowing dress, fake nails and women’s jewellery. Skarsgård has yet to show his glorious Viking face yet. Will these actors be as successful in their new roles as they were in True Blood? It’s hard to say yet. Denis O’Hare who played Russell Edgington in True Blood (Photo: HBO; Pinterest) is almost unrecognisable in his role as Liz Taylor in American Horror Story: Hotel (Photo: FX; Daily Express). Photo montage by Anthony Hogg. Another cast member to keep an eye out for is Donald Sutherland, who’s prior vampire experience was he played Richard Straker in Salem’s Lot (2004). But the connection doesn’t stop there. His his son, Kiefer Sutherland, played the bad boy vampire in the cult classic The Lost Boys (1987). Donald’s other son, Angus Sutherland, played Shane, another bad boy vampire, in The Lost Boys sequel, Lost Boys: The Tribe (2008). In my opinion, we are dealing with vampires; after all the credits confirm it. Murphy, just like others before him, has altered the classic tropes, adapting his story and characters with a more modern spin. The vampire myth evolves with it’s audience and only time will tell if Murphy can pull off a successful season that resonates with vampire and horror fans. Cher, was set to play a vampire: Erin Chapman,”Will Cher Play a Vampire On ‘American Horror Story’?,” Vamped, Sept. 22, 2014, accessed Oct. 11, 2014, http://vamped.org/2014/09/22/will-cher-play-a-vampire-on-american-horror-story/. in the video below: “American Horror Story: Cher,” YouTube, 0.11, posted by Cherilyn, Aug. 24, 2014, accessed Oct. 11, 2015, https://youtu.be/588Hj_LZksg. series creator, Ryan Murphy, told Entertainment Weekly: Tim Stack, “Ryan Murphy on the Bloodsuckers of AHS: Hotel: ‘It’s not vampires. There’s no capes and fangs’,” Entertainment Weekly, Aug. 26, 2015, accessed Oct. 11, 2015, http://www.ew.com/article/2015/08/26/american-horror-story-hotel-vampires-ryan-murphy. The video below shows the highlights: “Lady Gaga ● All Scenes – American Horror Story – Hotel ● 20152016 ● HD #AHSHotel,” YouTube video, 8:12, posted by StewieBolisHD96, Oct. 8, 2015, accessed Oct. 11, 2015, https://youtu.be/OcyB3NMY6N8. IMDB lists the characters as: ” ‘American Horror Story’ Checking In (TV Episode) – Full Cast and Crew,” IMDB, 2015, accessed Oct. 11, 2015, http://www.imdb.com/title/tt4217832/fullcredits?ref_=tt_cl_sm#cast. otherwise known as: “The Countess (Character),” IMDB, 2015, accessed Oct. 11, 2015, http://www.imdb.com/character/ch0516242/?ref_=ttfc_fc_cl_t10. 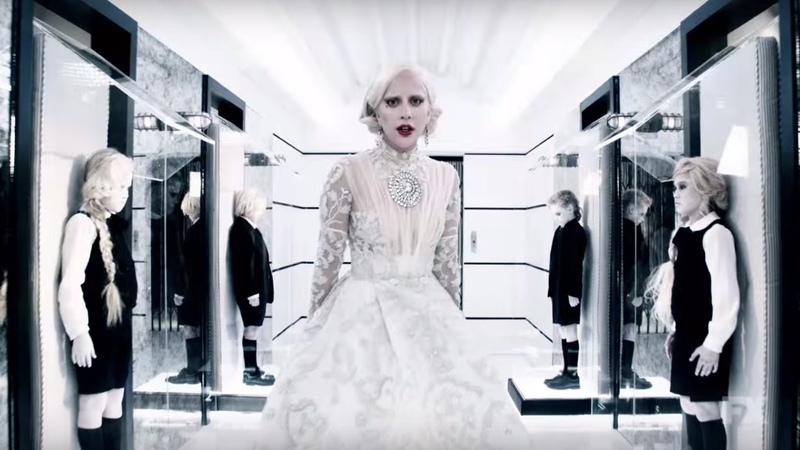 elaborated on the character for Variety: Elizabeth Wagmeister, ” ‘American Horror Story’: Lady Gaga & Entire Cast’s ‘Hotel’ Characters Revealed,” Variety, Aug. 7, 2015, accessed Oct. 12, 2015, http://variety.com/2015/tv/news/american-horror-story-hotel-season-5-spoilers-lady-gaga-character-1201559199/. 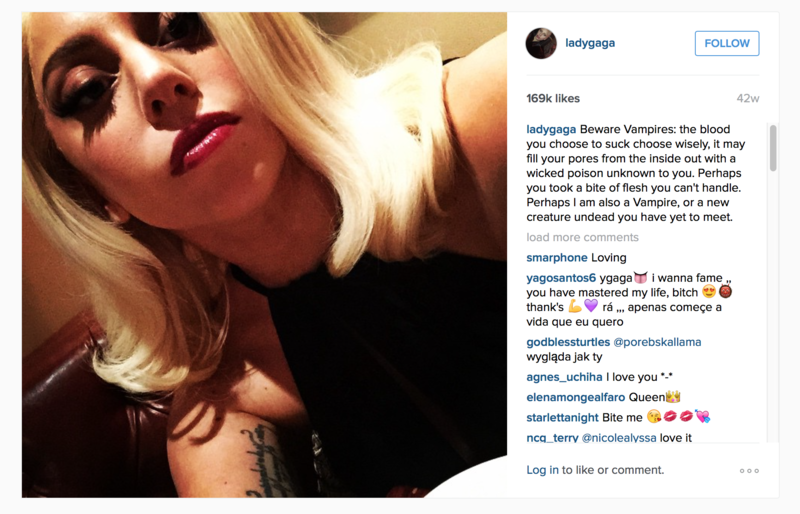 Gaga’s Instagram account bio: Lady Gaga, Instagram account, accessed Oct. 12, 2015, https://instagram.com/ladygaga/. might have been a hint at her upcoming appearance on AHS: Lady Gaga, Instagram post, Dec. 21, 2014, accessed Oct. 12, 2015, https://instagram.com/p/w14-XGJFK1/. re-contextualises vampirism as a disease: Steve Leighton, www.Vampirewebsite.NET, 2005, accessed Oct. 11, 2015, http://vampirewebsite.net/. as Anthony clarified in a blog post: Anthony Hogg, “Real Vampires,” The Vampirologist (blog), May 8, 2014, accessed Oct. 11, 2015, https://thevampirologist.wordpress.com/2014/05/08/real-vampires/. consider what haemophilia actually is: “Haemophilia,” Wikipedia, last modified Oct. 10, 2015, accessed Oct. 11, 2015, https://en.wikipedia.org/wiki/Haemophilia. “People with haemophilia”: Ibid., accessed Nov. 11, 2015.
instead rely on one of two types of treatments called Prophylaxis: Baxalta, “Prophylaxis,” Haemophilia Care, 2015, accessed Nov. 12, 2015, http://www.haemophiliacare.co.uk/prophylaxis.html. hematomania: “Hematomania,” Definithing.com, 2015, accessed Oct. 11, 2015, http://definithing.com/hematomania/. If I could turn back time—to Sept. 22, 2014, I would find a way for you to read Erin’s article, “Will Cher Play a Vampire on ‘American Horror Story’?,” published here on Vamped. Lady Gaga’s character seems to be inspired by Countess Bathory in a vampire movie called “Daughters of Darkness” which was also set in a hotel.